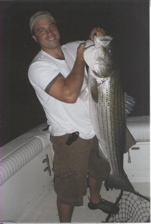 CTFishTalk.com: Rough Water Harbor entrance Video! - Connecticut Offshore Fishing ( CT Offshore Fishing ) - A Community Built for Connecticut Fisherman. Viewing Topic: Rough Water Harbor entrance Video! Posted: Fri Oct 12, 2007 9:02 am Post subject: Rough Water Harbor entrance Video! This footage is of Charter boats coming back into Depoe Bay in some very bad conditions. Depoe Bay is the smallest natural harbor in the world. Well at least the travel board calls it that. Hold on to your keyboard. This is rough water!